Th-INK-ing of You: Happy Father's Day! Hello Friends! Happy Father's Day to all the Dads today! We are spending time with family to celebrate Dad, and I thought I'd share the card I made for my husband. I used the image from the ODBD set Living Waters. I used copics to color this and I added a few white accents with a paint pen. I had to extend the scene just a bit on the sides to fit in the Double Stitched Rectangles, so I colored it out beyond the line with my copics, then accented with a Micron .005 black pen. If you ever do that, be sure to use your copics first to color, and then add the Micron ink lines, because the ink will run if you color over top of it with alcohol markers. 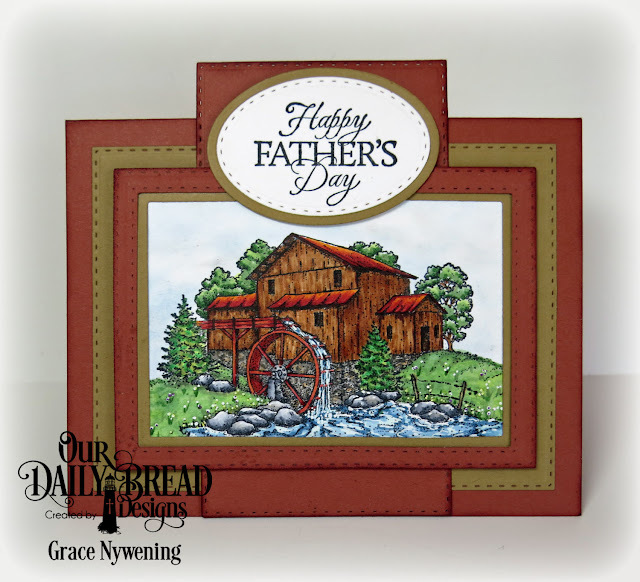 I added the Happy Father's Day sentiment from the Good Man set, and die cut it with a Stitched Oval die, and matted with the ODBD Ovals. I made the frame for the image using the Double Stitched Rectangles along with the ODBD Rectangles so the center was cut out, leaving a frame. I then matted the framed picture with another Double Stitched Rectangle. The edges are sponged with Distress Ink. I loved coloring this and it's a nostalgic image that I hope my hubby will like. Happy Father's Day Alan! I would also like to honor my own Dad on this Dad's day. He went home to be with the Lord back in 1973, at the age of 60. I still miss him! He was a Godly man, a Pastor, and a wonderful father. I'm so glad that I have the assurance that we will see each other again one day! I hope you are all enjoying a wonderful family day together.... Happy Father's Day! What a great card for men! So hard to make for those not interested in sports. This one is especially perfect for any occasion. Love the framing and coloring. Thanks for sharing this. What a beautiful card Grace, and I am sure it has been appreciated. Love your colouring of the image and the surrounding rectangles. You Make Me Happy In My Heart!